Back in November I reached new heights of whisky blogging fame, in receiving my first free sample. So the first review here in particular carries an even bigger full disclosure disclaimer than normal: I received a free sample of Laphroaig Cairdeas 2017 Quarter Cask from the distributor and therefore my objectivity may be slightly tainted. Good. 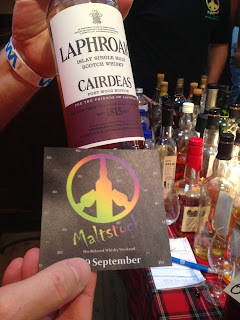 Now we have that out the way, I also happened to taste the extremely hyped Portwood version from 2013 recently and it seemed like a good moment to put my notes up together. Nose: Like being back on Islay. Standing at the floor maltings at Laphroaig. Really lovely smoked malt aroma, peat, earth, smoke, orange, oysters and lemon sponge cake. Underneath that there's kippers and sea salt, butter and toast, then some more mineral aspects with flint. There's just a little rubber out of place. Taste: Soft start, then some acidity with lemon juice, quite Caol Ila like actually with that very acidic lemon and big smoke, salty fish, quite maritime and clean. A little vanilla, malt and perhaps some white chocolate. Finish: Medium/Long length. Very clean for a Laphroaig, more Caol Ila-like for me. More lemon, more smoke, more mineral with granite. Lovely lovely nose, but the taste and finish were much cleaner than expected suggesting that this one is a little younger than I had thought. Nose: Strikingly balance for big peat and port. Toasted marshmallows and gristy peat, ash, blueberry, campfire smoke, Smores, pockets of florals. Water: Becomes more toasty, but not as balanced. Taste: Intense and builds up even more, very nicely too, very balanced but very powerful smoke, sweetness from the Port, blackberry. I don’t really know how, but the smoke and Port have balanced really well here. Water: Softer, still powerful, more citrus- lemon. Finish: Long length. More port here with juicy blackberry, black pepper and ashy peat. Keep it neat. 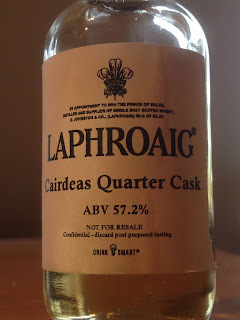 An awesome modern Laphroaig #livethehype If you asked me whether Laphroaig would be better from Port or Quarter casks, I’d go with Quarter 100%, but this has such great big flavours that shouldn’t work but completely do. Oh and thanks to the guys at Maltstock, who always seem to want to give me awesome whiskies!